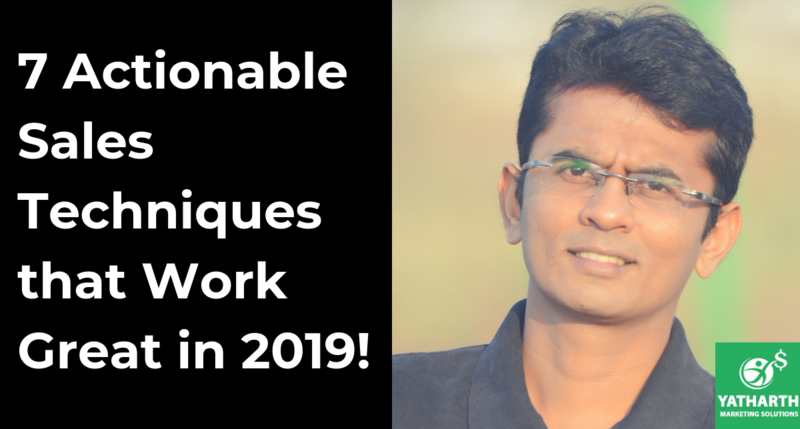 7 Actionable Sales Techniques that Work Great in 2019! The world of sales is filled with a lot of well-meaning, but vague advice. Everyone you meet will have some single wonderful idea that helps them make sales. But if you have spent any time in sales, you very well know that there is no ‘one-size-fits-all’ plan. That is why sales strategy is always a work-in-progress, never a final blueprint. However, it is important to have a few right sales techniques that you can depend on to achieve your sales targets. At Yatharth Marketing Solutions, we offer sales training and sales consultancy with the latest techniques. We empower sales teams with techniques that are scientifically proven to achieve sales faster. These techniques build trust with potential customers and break down barriers for you. In this blog, we will help you shape your sales pitch using some proven techniques. Please note that it is not correct to expect instantaneous sales results. What are trying to do is help you understand proven sales training best techniques that empower your team to achieve real success! Best Sales Techniques that Work Great in 2019! This is not really a technique. It is more of a style of doing business the right way. Put yourself in the shoes of your customer. How many times have you walked away from a deal because you did not like the approach of the salesperson? There may be nothing wrong in the product or the service itself, but you are just put off by some aspect of the communication itself. At YMS, we insist on the basics. Getting your approach technique right is important. These are some things you can do that will ensure a smoother relationship with your potential clients. But not to worry, this isn’t as exhausting as it sounds. These are the basics of classic sales techniques. The reason they are so effective is they focus on your listener or your buyer. By building an equation around them, it is easier to convince customers how they are benefitting from this relationship. So, always make sure you are following these simple ‘Always’ rules. An effective salesperson has to have a complete understanding of who the potential customers are, and what the market ecosystem looks like. It’s not about superficial details like company name or website URL. What you need is to really understand their motivations and methods of functioning. Who are your competitors in the same space? What benefits does your solution offer that can be leveraged over your competition? It’s your responsibility to examine how your competition makes a pitch, and do something innovative. These insights give you a better handle on the sales process. When you are unique in the marketplace, your prospects have a better chance of hearing from you. Most people approach sales as an open-ended question. Which it is, but to a fair extent, it is also a Q&A session. Customers have a lot of questions, and if you can answer these to their satisfaction, you are closer to the deal. However, there is no one perfect pitch. However, when you prepare for all possible scenarios in your interactions, your pitch has a greater chance of success. Sales training is a wonderful opportunity to identify objections that come up from potential customers. You can collaboratively craft scripts to respond to these issues. Having a singular script is looked down upon sometimes, likening the responses to that of a robot, but that should not be the case. Instead, writing down responses help reassure clients about their fears, and move on to the real issues. Think of it as a cricket team. They spend countless hours practicing the basics – batting, bowling, and fielding – so that on game day, they don’t have to think about it. They can instead focus on adapting their techniques to the team that they are playing. Similarly, with the basics all written down, you can move past common objections of clients quickly, and focus on innovative ways to finalize the deal. This is like a template that you and your team can use to get better and faster at sales. Whether you are a small company or a big corporation, efficiency is the name of the game. We mean, efficiency is not just distributing the workload, but in generating revenues from every step in the ladder. Listening to the numbers is the quickest way to understand your sales process, and break it down into what’s working and what’s not. Every salesperson has to pay close attention to metrics and marketing funnel to understand what’s working, to what extent, and what’s not working. What helps close more deals? What are the obstacles? Data analysis is a time-consuming effort. One way of getting started is by understanding bi-annual and quarterly sales reports. Detailed metrics have to explored and substantiated, even if the reports are on a high level. Each report will have its own insights which can be leveraged for smarter decisions, which will have positive results in the long run. Sometimes there is a delay in response from the customer. In most cases, sales teams and organizations assume there’s no interest, which means there is no point in following up. However, having a proper follow-up routine is crucial for higher conversion rates. Discipline is the key to a proper follow-up etiquette. It is acceptable to reach out to potential customers as many times as necessary to get a response. Only when the response is explicitly negative, the lead should be discarded. Of course, even rejection can be a part of sales negotiation. So it is important that your team works from established values and sales processes to determine the frequency of the follow-up. The final judgment on this can only be from individual salespeople, so ensure they are up-to-date on the company policies in this regard. Marketing and Sales teams are dependent on each other to accomplish mutual goals. Both the teams have to complement each other in terms of adding value. As a salesperson, employ your marketing team to your advantage. Engage with them to understand the response to your communication. The idea is to mine insights into customer behavior, and guide the marketing team so they can bring in higher quality leads for you to pursue to a close. Transparency between the teams will benefit both. It is your responsibility to make the marketing team understand the types of leads that come in and to show them the time it takes for you to close a sale depending on the types of leads. They can update the marketing campaigns to help you close deals faster. This is another simple sales technique that will help you become more efficient in your game. Rather than leaving the future course of action dependent on their response, create your next steps before you leave. At the end of each meeting with a prospective customer, salespeople usually mention that they will quickly get back in a few hours or the next couple of days. This usually makes it harder to get the next meeting, because they are outside your influence. Instead, when ending a sales call, finish on definite action. If they want another meeting, book the time, place, and people needed right then and there. This is also a wonderful opportunity to have a predetermined agenda for the next interaction. This ensures that the customer too is committed to taking the discussion further. Of course, a strong, positive impression is the next best thing to a sale you can leave with. Sales training is a never-ending process. There are always going to be newer sales techniques, more efficient sales pitches, newer customer objections, and other issues (including competition). The true strength of salespeople is their drive and motivation to be the best. At Yatharth Marketing Solutions, we offer sales consulting services to bring out the best in your sales team. For us, the best sales training practices are the ones that help organizations not just sustain but thrive in the competitive marketplace. We motivate teams and ensure that they stay updated on the products/ services offered by the company, the latest market trends, and on the competition. Mihir Shah is CEO and Founder of Yatharth Marketing Solution, the group specialized in offering personalized sales training programs to corporates worldwide. He is able to draw several years of experience imparting to management, sales, and corporate training serving wide industries. Mihir has assisted companies to grow incomes and enhance customer satisfaction score as well as assisting managers, leaders, and directors enhance the performance of their team with training.